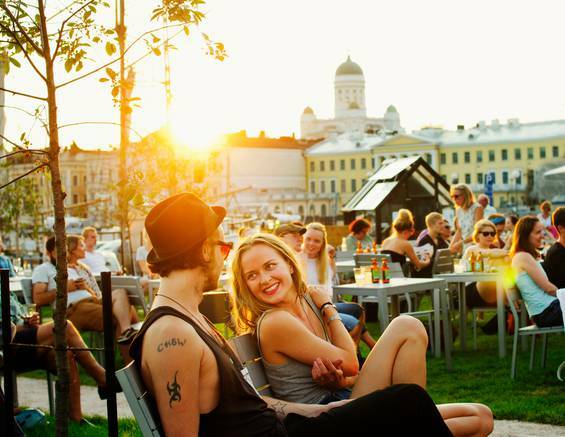 Visitors to Helsinki in summertime find that they can fit a lot of activities into one day, as the daylight lasts for up to 19 hours between sunrise and sunset. Around 750,000 visitors are expected to stay in Helsinki during the main tourism season from May to September, accounting for half of the annual total in just five months. Traditional favourites, new attractions and countless events are on offer to delight visitors from both Finland and abroad. A scenic cruise through the archipelago is a great way to enjoy a summer’s day and the fresh sea air. Cruises depart from the Market Square and offer a variety of thematic routes, as well as lunch and dinner cruises. Sun Lines has even converted one of its vessels into a real party boat. Four-hour party cruises aboard m/s Emma take place on Friday evenings from 8pm to midnight and are offered from 11 June to 10 September. Around 200 partiers can enjoy music played by top DJs, sparkling drinks and, of course, the stunning archipelago scenery. The price includes not only the cruise, but also free admission without queuing to the after-cruise party at the nightclub Jenny Woo in the city centre, plus a welcoming drink in the restaurant. Royal Line offers the chance to cruise while enjoying royal treats and tales. The ”Royal Lunch Cruise” takes passengers along the coast of Helsinki and relates stories of visits by Swedish royalty to particular places along the way. IHA-Lines in turn offers a brand new ecofriendly cruise vessel that has been designed for 200 passengers. The green technology includes a closed water system that prevents water from the kitchen, for example, from getting into the Baltic Sea. The company’s long-term and responsible work has been recognised by the City of Helsinki, which awarded IHA-Lines its Environment Award in 2010. In addition to sightseeing buses and scenic cruises, visitors should also try a ride through the city on a historic tram. The company Oy Stadin Ratikat Ab has teamed up with Helsinki City Transport to offer this unique historical experience this summer. The fully restored open-top tram dates back to 1919 and will run on weekends from 15 May to 19 August. Rides last for around 15 minutes and depart from the Market Square (tram stop 1) every half hour between 10am and 5pm. The tour takes in Kruununhaka, Kaisaniemi, the Central Railway Station and Aleksanterinkatu. American architect Travis Price has designed a special installation based on the Kalevala, Finland’s national epic, to be erected at Seurasaari. The installation is part of the Spirit of Place student project and will be built on the southern tip of the island over a period of nine days from 16-24 August. The temporary structure will allow visitors to the museum island to experience the world of interdisciplinary urban art. It is now possible to travel by ferry directly from Helsinki to the major Russian metropolis of St. Petersburg. The Princess Maria operated by St. Peter Line has over 606 cabins and can carry over 1600 passengers. No visa is required if the return journey is within 72 hours of arrival in St. Petersburg and if a city sightseeing tour is included in the ticket. A hotel reservation is also mandatory if passengers want to stay overnight in St. Petersburg. The highlight of the summer on Seurasaari Island is Midsummer Eve, when visitors can experience the essential elements of the Finnish summer celebrations: the midnight sun, bonfires and midsummer poles, flowers and birch branches, spells and charms, music and dancing, the Finnish flag and singing. A special performance this year will mark the 175th anniversary of the Kalevala, the Finnish national epic. This year visitors will also get to walk along a new path of spells and charms. The Midsummer Eve celebrations take place on 25 June from 6pm to 1am (tickets: €15/adults, children under 12 free of charge). On Midsummer Day, 26 June, the programme includes a church service in Karuna Church at 1pm and dancing from 2:30pm onwards (free admission). Families are also welcome to attend Children’s Seurasaari events that will take place on 30 June and 28 August.